The Renault Scenic started life in 1996 as a five-seat compact MPV based on the underpinnings of the Megane hatchback of the day. It was one of the very first cars to adopt that concept and the fourth generation has just launched on the Irish market. These days, there are five-seat and seven-seat models, with noticeably different body styles. The bigger car is called the Grand Scenic. You won't mistake the 2017 model for the one before either, as Renault has been very daring with the new car's design. There are even 20-inch alloy wheels as standard across the line-up. There isn't huge demand for five-seat MPVs in Ireland, evidenced by the higher sales of seven-seat versions, but even so, there are plenty of options for buyers of both. Renault's compatriots over in Citroen produce the top-selling C4 Picasso, while Ford offers the C-Max in regular and 'Grand' flavours too. Volkswagen has the Golf SV as a five-seater and the seven-seat Touran, and the Toyota Verso is another option. The outgoing Peugeot 5008 is a good alternative, though it's about to be replaced by a larger, more upmarket SUV-like vehicle so it may not compete directly any more. Finally, from the premium manufacturers are the BMW 2 Series Active/Gran Tourer and the Mercedes-Benz B-Class. Although likely to be expensive, Renault Ireland has confirmed the availability of new Hybrid Assist engine electrification technology on the Scenic. An electric motor, powered by a 48-volt battery, takes over some of the work of the 1.5-litre diesel engine to provide lower fuel consumption and emissions. During deceleration, it recovers energy for use by the vehicle’s electrical system and for storing in the system’s independent battery. It also serves as a 10kW motor that enhances acceleration. Hybrid Assist allows fuel consumption and emissions to be reduced by approximately 8 to 10 per cent in comparison with the standard engine, according to Renault. What will the range be like? Renault has already released pricing and range information. The five-seat Scenic starts at €26,000 with a 1.2-litre petrol model in Expression+ specification, while the entry-level diesel is the 1.5 dCi 110 Expression+, at €27,000. Other trim levels are called Dynamique Nav, Dynamique S Nav and Signature. The majority of Scenics are powered by the 110hp 1.5-litre diesel, though a 1.6-litre diesel is also offered, producing 130hp. An automatic transmission is available with the 1.5. Meanwhile, the Grand Scenic starts at €28,400 and follows a similar line-up, the only notable exception being the option of an automatic gearbox in conjunction with the 1.6-litre diesel in 160hp guise. 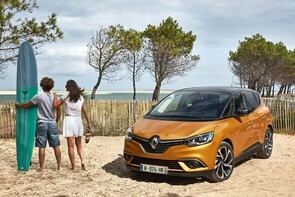 The Renault Scenic will certainly grab attention with its daring design, but we found the five-seat model to offer little more than its rivals in terms of interior space, cleverness and flexibility. The Grand Scenic is a better car and should appeal to Irish families that need lots of room yet also want to cut quite a dash.